First I have to say I LOVE Toy Soldiers. I can spend hours just browsing the net desperately hoping I win the lottery so I can go on a massive buying binge! 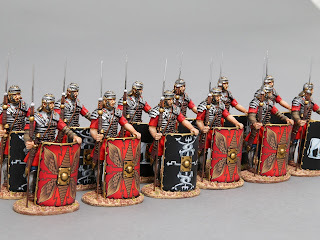 It's probably the first thing I'd do in fact, once the heart rate had settled I'd be adding to my favourites all the links to the soldiers I was going to buy as soon as the money came through and high on my list would be Thomas Gunn and their excellent range. 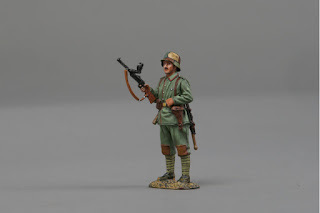 Now after receiving my first batch of soldiers to review Thomas Gunn has easy jumped to the top of the Toy Soldier makers that I'd be visiting. Actually I wouldn't be surprised if I didn't buy everything they had for sale! Now I'm not saying you need to win the lottery to start collecting toy soldiers, far from it and with Thomas Gunn the prices are very competitive, in fact cheaper on the whole compared to other major companies, yet easy matching if not beating them on quality.Thomas Gunn miniatures have been trading since 2009, which really isn't that long at all and is most likely the reason why you may not have heard of them, because it certainly isn't down to a lack of quality with regards to their miniature range, and I'll say here and now that the soldiers reporting for inspection passed with flying colours, and where dismissed with their heads held high, well would have held their heads high if they could, but they can't, because they aren't rea...oh you get the point. The Toy Soldier market is dominated by the famous and well established William Britain's, and next I suppose is King and Country. So it's not easy I'm sure trying to carve out a piece of the market for yourself. 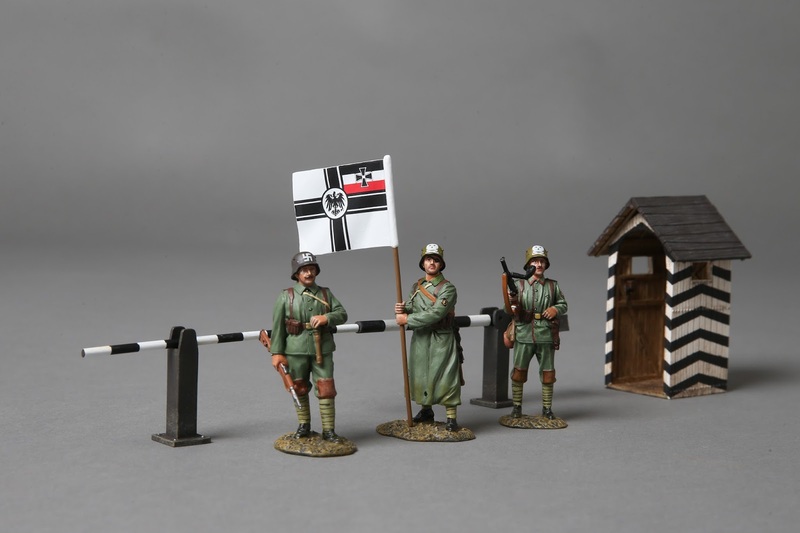 You certainly have to have a pretty special product range, which has to ooze quality to have any chance of turning collectors’ heads and getting them to make a move away from Britain's and King and Country. 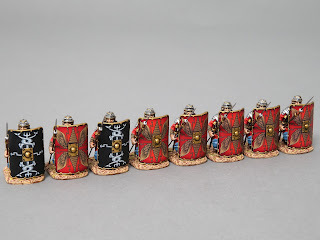 Thankfully Thomas Gunn has done just that, as I'd imagine by now if they hadn't I wouldn't be writing this review and we would be deprived of what is a first class range of miniatures covering a variety of eras and conflicts. In fact business looks so good I'll say here and now if you do have your eye on something, don't hang around, as the out of stock signs are a sad reminder of what I could have had if I hadn't been such an indecisive fool. The first soldier up for review is ROM002A. 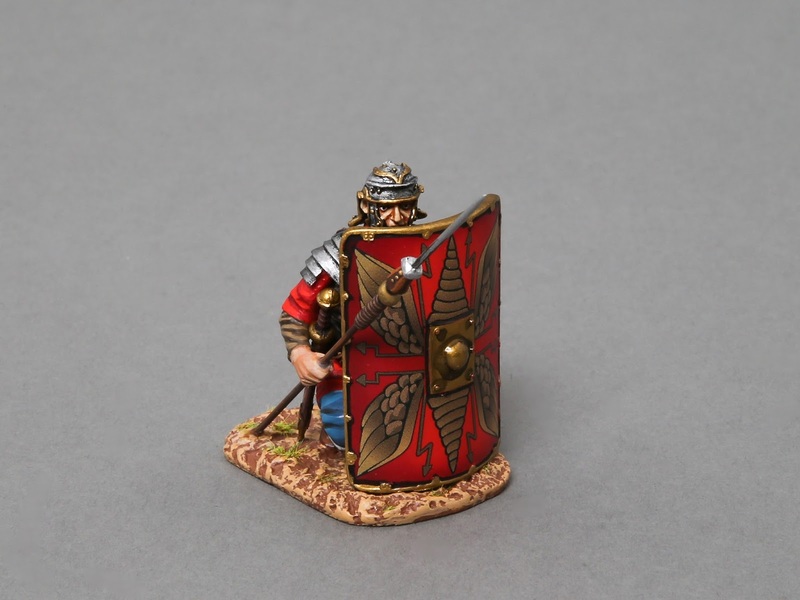 Here we have a Roman legionnaire standing at the ready with the easy to recognise Imperial red shield. There are actually two other variants that are limited editions of just 100 each. One has the black 30th legion shield and the other the black 9th legion shield. 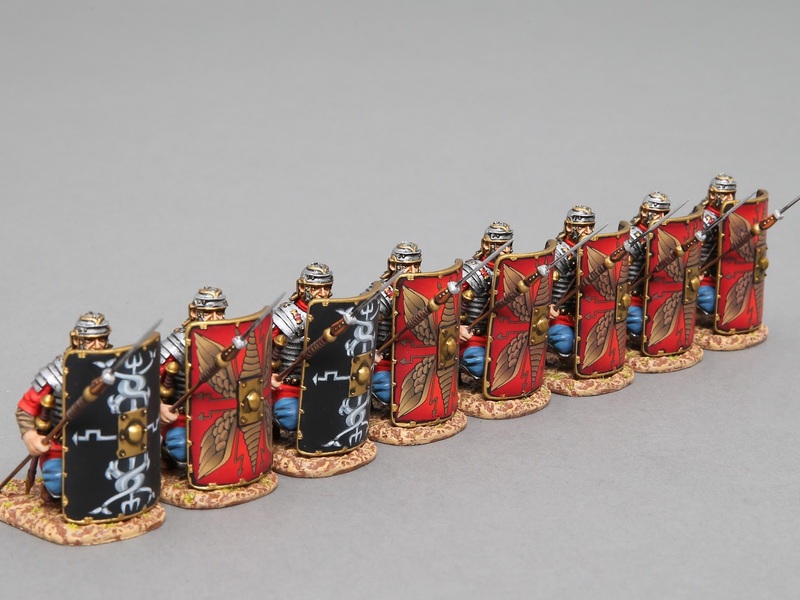 You'll find all Roman legionnaires have these limited edition versions. Unusually for Thomas Gunn they will keep producing the red shield variant for as long as there is demand. The detailing is excellent and can't be faulted. His Pilum (like a spear) is very sturdy considering how thin it is so no fear of easily bending it. It is very sharp so keep it away from children or the Romans will still be causing injury! He has his Gladius on one side and his Pugio on the other. The Romans skin tone is spot on and he is standing on a textured base. 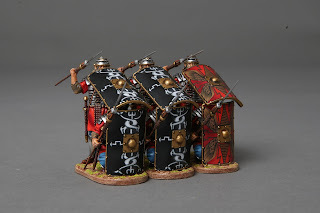 The shield is a work of art and the paint work is excellent all over, his armour looks excellent with good use of shading. 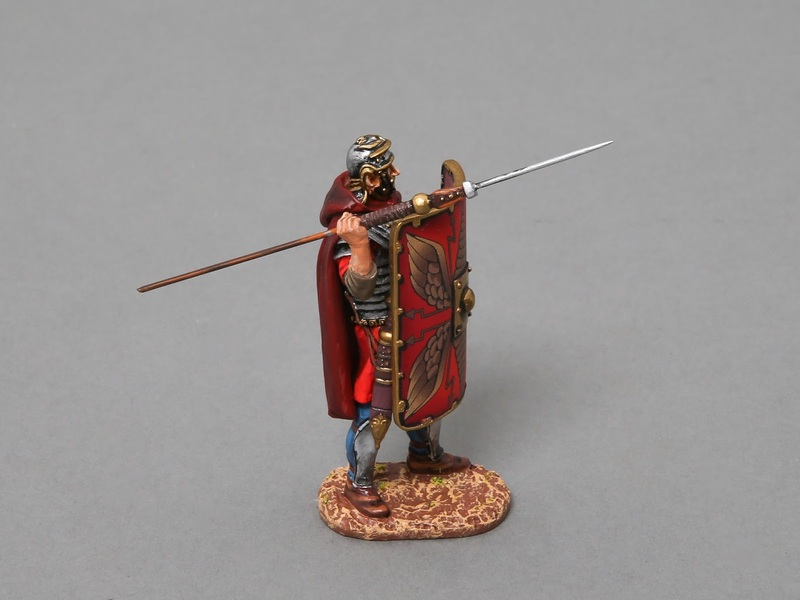 This Roman will stand proud in any ones collection. He comes in a silver box and is meticulously padded so no fear of any damage in transit. He is priced at £32.50 and well worth the money. If you’re lucky enough to get a limited edition 30th or 9th legion then I'd easy see this as an investment that will increase in price over time. 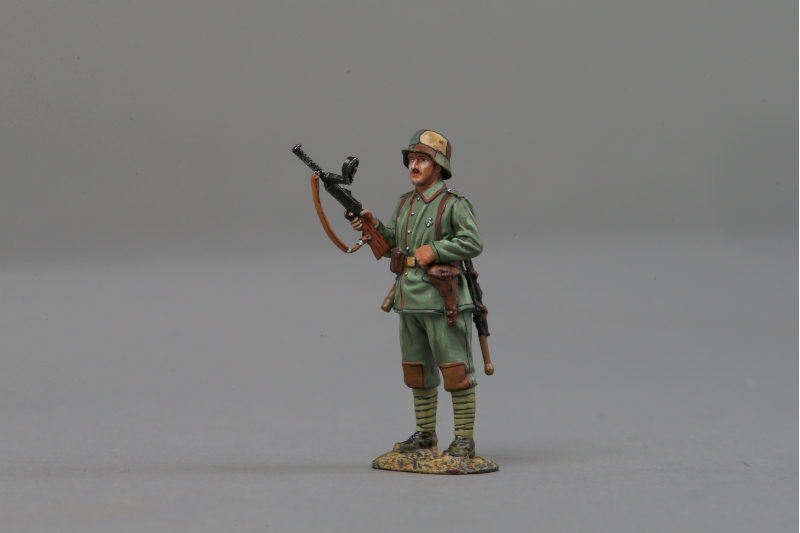 Second soldier up for review is ROM005A. 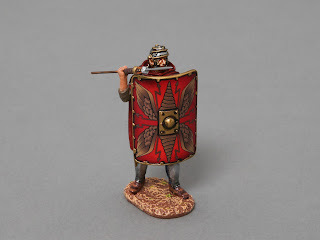 This time we have a Roman legionnaire marching in the second rank with his Pilum raised. Again it comes in three variants. The one I have has the imperial red shield but it also comes in two limited editions of 100 each one has the black shield of the 30th legion the other the black shield of the 9th legion. Again the detail is excellent. 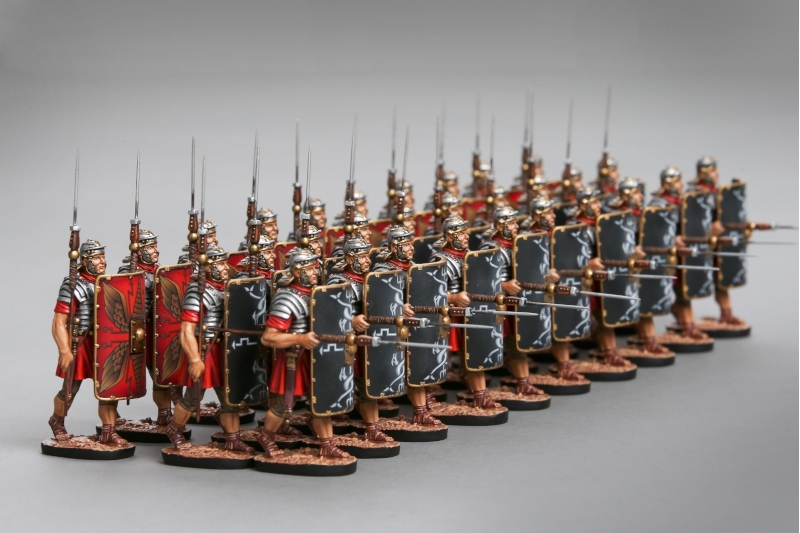 At his side are on the right his Gladius sheathed and on his left his Pugio. His Pilum is very sturdy for such a thin component. The paint work again can't be faulted. Skin tone is spot on, even his eyes are well done. His armour and helmet look great and shading has been done to good effect. Like the standing Roman he comes on a textured base and is a good solid weight. I really can't fault it at all. He is another Roman who will enhance anyones collection. 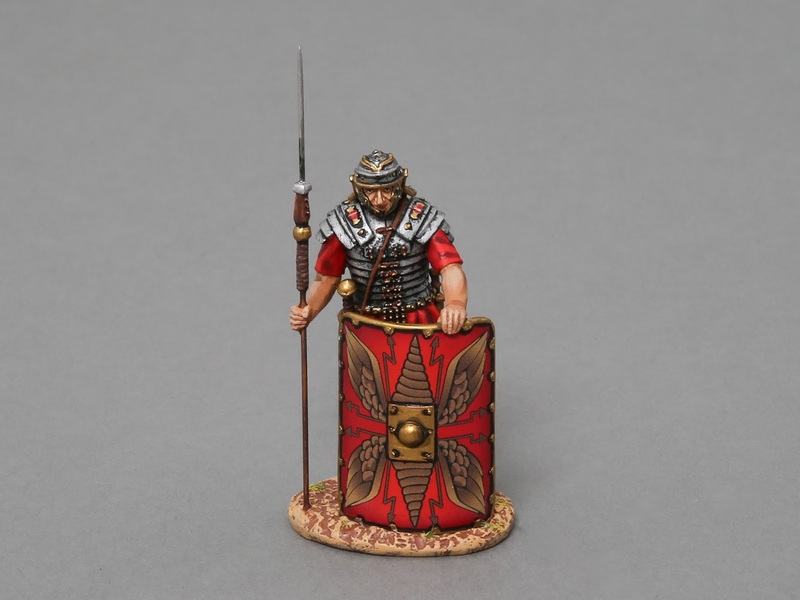 Again the imperial red shield variant will be produced for as long as there is demand. He comes in a silver box and great care has been given to padding so he wont get damaged in transit. He is retailed at £32.50. 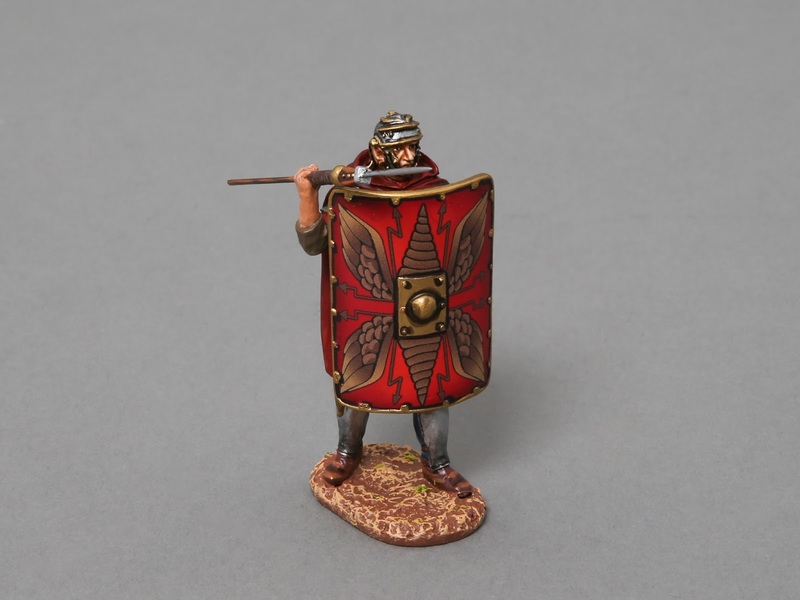 Like the standing Romans see if you can get hold of one of the limited edition Romans if you’re not too bothered about what shield he has. 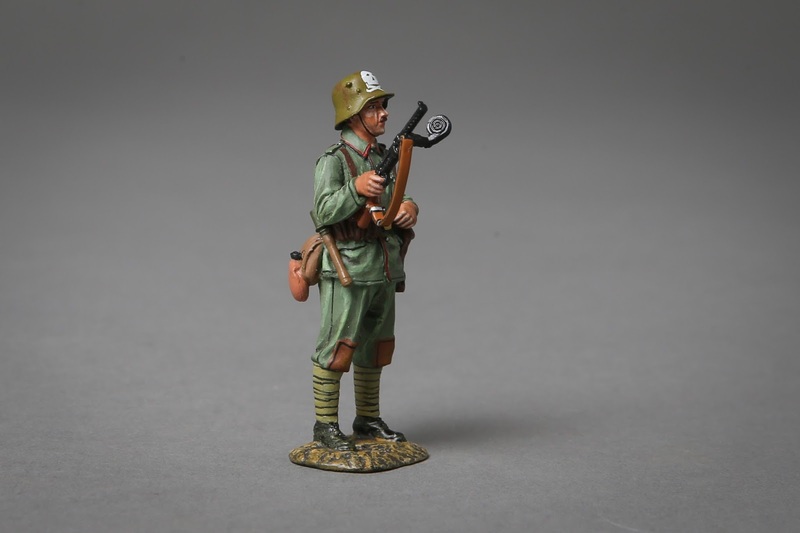 Third soldier is ROM006B. 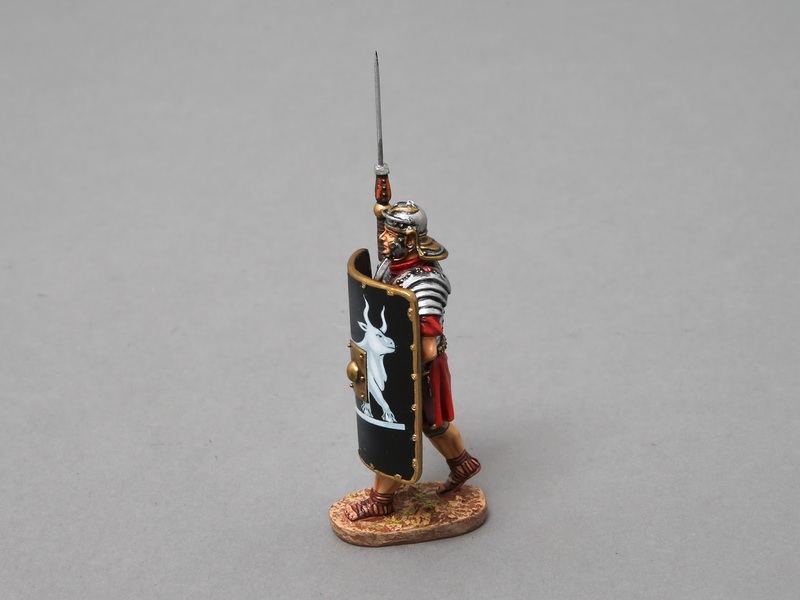 This Roman legionnaire is kneeling, all ready to repel a cavalry charge. Unlike the other two this one comes in only two variants, the first has the imperial red shield and the other is again limited to just 100 and has the black 30th legion shield. I'm lucky enough to be reviewing the 30th legion legionnaire. He has blue trousers where the other two had a tan coloured trouser. He also has long sleeves where the other two had short sleeves. He has his Galdius sheathed on his right hand side and his Pugio sheathed on his left. His Pilum is angled all ready for the charging cavalry and again it's very sturdy and sharp so I fear for the charging horse! Just like the other two the detailing is excellent with as much care given to his back as it is to his front. Helmet and armour are again excellent and painted very well indeed with all the details picked out. Skin tone again is excellent and shading has been done to good effect. His black 30th legion shield is as impressive as the imperial red shield and like a mini work of art. He stands on a textured base. He comes in a silver box and like the others great effort has gone into padding so he won’t get damaged. Its things like this that really show the passion these boys and girls have for their soldiers. Like the others he is retailed at £32.50. If you’re after one of the 30th legion ones then be quick! The fourth and last Roman up for review today is ROM007A. This time it looks like we've gone to the frozen north to battle the Germanic barbarians! 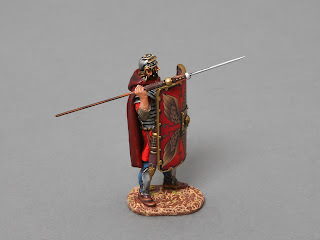 He is a standing legionnaire who is about to launch his Pilum into the barbarian horde and then hopefully be quick enough to unsheathe his Galdius for some bitter and violent close quarter combat. Or maybe after launching his Pilum the Romans quickly move into one of their famous formations...it's all down to your imagination. Unlike the other three this time he is clothed for some warmth. He has a long red, hooded cloak, long blue trousers and again has long sleeves. Like the others his Pilum is very sturdy and sharp. He has his imperial red shield raised yet the paint work on his armour behind the shield is just the same quality as if it wasn't hidden behind the shield. Shade work on his robe has been done to great effect and like the others he can't be faulted. Skin tone again is perfect and his eyes have been painted very well indeed. He has his Gladius sheathed on his right and his Pugio even though nearly hidden by his cloak has been modelled and painted to great effect. Its detail like this that shines through and you know you have a top quality solider in your hands. 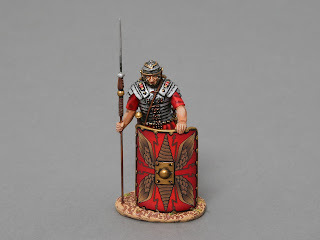 Like the previous soldier he comes in two variants the red imperial shield version that I have here or a 30th legion shield version which like the others will be limited to just 100. The imperial red shield version will be produced for as long as demand. So if you want a 30th legion version then I suggest you buy now! He comes in a silver box and like the others you can see great care has been given into padding so it won’t get damaged. He retails at £32.50. The final soldier waiting for inspection probably feels abit out of place standing with the Roman legionnaires, however I'm sure they are far more scared of him than vice versa. We jump well over a thousand years into the future and standing before me is a Freikorps soldier. This is part of Thomas Gunn's' excellent Great War range. We are actually in 1920 Germany and waiting for inspection is GW060A. The Freikrops had been around before WWI but came to prominence post WW1 as ex-soldiers joined up to combat the threat of the communist Spartacist league. Many major movers in the Nazi party had been in the Freikorps which is why it's seen as the beginnings of the Nazi party. This particular soldier is standing sentry, part of a series of three made and a further three in production. The version I have is wearing his old German Stormtrooper helmet and proudly wears his Iron Cross, another version is wearing the Freikrops helmet which has the skull and cross bone motif on it. 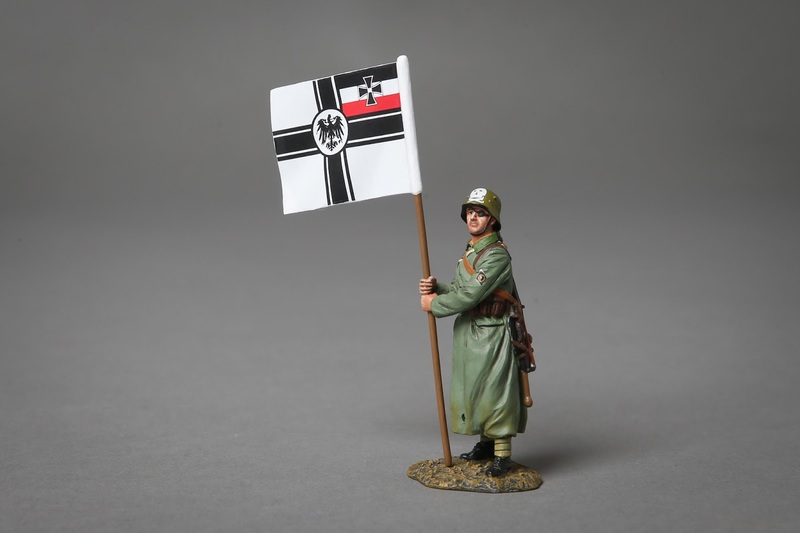 He is also wearing his old Stormtooper late war uniform where again the other version has Freikorps markings. 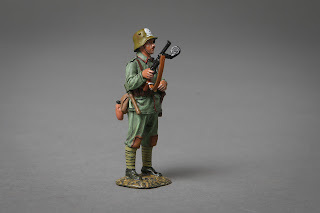 He also has a pistol on his left hand side in a holster, his old army canteen and spade attached to his belt and is holding a Bergmann MG (an unusual gun that I haven't seen before) . I'm trying to find some negative but I really can't. The quality of modelling is first class. The details are superb, right down to his moustache. 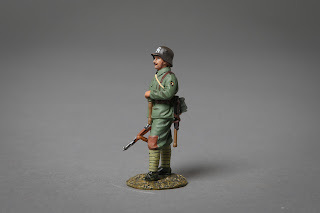 Again skin tone is spot on (I compared him to a King of Country soldier and I have to say the K&C soldier looked very sunburnt in comparison). 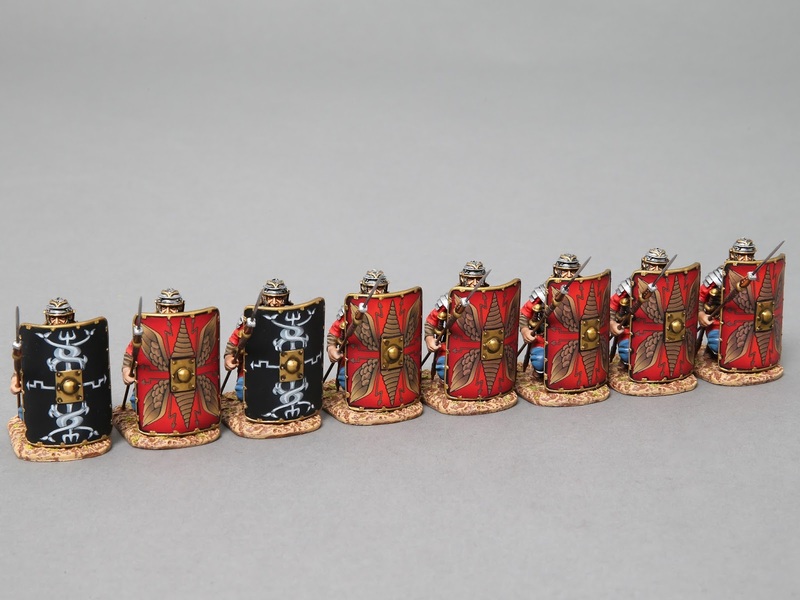 The paint work is faultless with all the details expertly picked out and great use of shading. To be honest he is my favourite out of the five, not because the others aren't as good quality wise but just because I'm interested in the period. They are even going to make a communist prisoner for the Freikorps soldiers on sentry duty! He stands on a textured base. I can't recommend Thomas Gunn enough and would love to collect the Great War range. He comes in a silver box and just like all the others great care is given to padding so he wouldn't get damaged in transit. He retails for the excellent price of £32.00 incl VAT! There is a Friekorps soldier holding a banner\flag who retails at £39. I have to say I've been very impressed with this first review batch of miniatures from Thomas Gunn. They far exceeded my expectations and they are on par if not even better than other major miniature makers. They are also sold at very competitive prices and are well worth the money. They have several ranges WWII, Berlin '38, Great War, African Wars, Foreign Legion, Napoleonic, French Indian War and finally Roman Empire. They also do top quality showcase pieces like WWI and WWII aeroplanes. I do hope we can form a ongoing partnership and I get to review more products in the near future. Thomas Gunn miniatures are an outstanding product to review and will certainly make the blog far richer.